I had always been that small-town girl with a loud voice, big dreams, and too many opinions. And I still am today, but these attributes along with my passions for the environment, social justice, and politics all worked in my favor when it came to Youth Parliament. My ears still ring when I recall my excited squealing and tears of excitement when Eugenie Sage emailed informing me I was to be her Youth MP for Youth Parliament 2016. During my six month tenure from January to July 2016 I held a climate change discussion with youth from South Canterbury, attended council and Environment Canterbury meetings with Eugenie, and formed lifetime skills and friendships. As student Board of Trustees representative for Craighead Diocesan in Timaru I met many like-minded youth at my week of training at Great Barrier Island in January this year; little did I realise I would be reuniting with some of these friends six months later in parliament. Along with Board of Trustees student rep, I have attended Canterbury Model United Nations, an Environment Canterbury youth summit, and events such as the Cancer Society's Relay for Life. These community events have all enabled me to form a better understanding and connections with my own community and form strong friendships with fellow Youth MPs I met along the way. So by Youth Parliament in July, I felt prepared to represent my fellow youth and community's best interests in Parliament. To add to the thrill, the day before Youth Parliament coincided with my 18th birthday, so I was lucky enough to spend my 18th birthday in Bowen House with the Green Party and the other Green Youth MPs. Youth Parliament itself was an unforgettable and surreal experience I will always cherish. I met many other like-minded and completely opposite minded youth and made friendships with a variety of youth MPs from all political parties. Sitting on the environment and local Government select committee was an informative and fascinating time with intelligent discussion and interesting speakers. We quickly learnt the importance of compromise and to respect each others views and questions, but we all managed to come to a positive agreement to limit plastic bag usage in the retail industry. My most nerve-wracking yet exhilarating moment was asking a primary question during Question Time of the Minister for climate change, about their Government's lack of action in combatting New Zealand's increasing green-house gas emissions. Being able to hold the Government accountable for not adequately addressing an issue like climate change, which will hit my generation and generations beyond me the hardest, was an empowering moment. The prospect of listening to roughly 80 speeches on a wide variety of topics on day two felt a little daunting after a night where I spent more time giggling and chatting than actually sleeping. But with such a variety of topics and opinions every speech was important and some moved me to tears and standing ovation with such powerful messages. 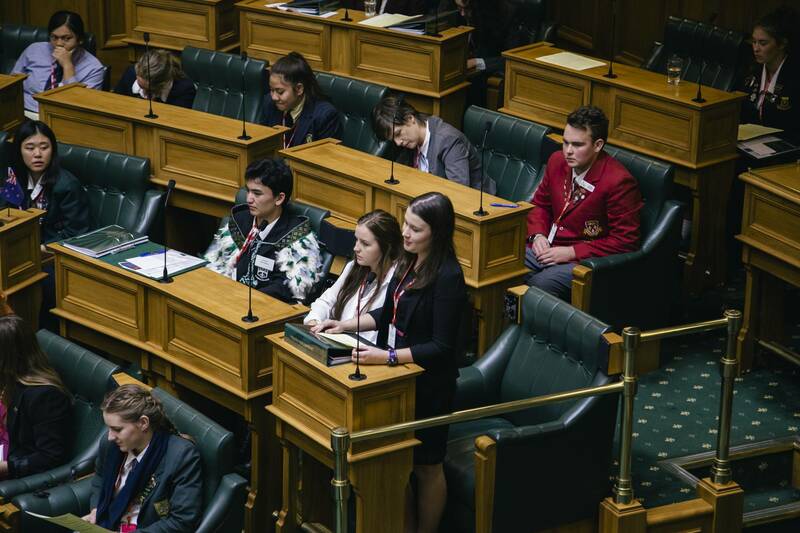 It helped me to reflect on how extremely fortunate I am to have had the opportunity to participate in Youth Parliament and how much of an honour it was to be sat in one of my role model's very seat in the chamber, representing my community and the views of youth across New Zealand. As for the future, I'm currently in the process of University applications and plan to pursue my passion for politics further with a BA in political science, history, and philosophy, and then on to a life serving people in politics or education. The friends I made and lessons I learned at Youth Parliament will remain close to my heart and I will always be grateful to Eugenie for selecting me to participate in this amazing opportunity. I'm also grateful to those who supported me along the way and put up with my countless passionate rants about the environment and social issues.